You can make these beans at home, and do so very inexpensively. To save time we start with canned black beans. If you ever want a filling side dish this is the perfect one. 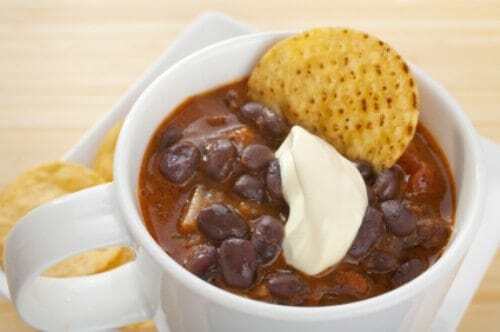 These beans are very easy to prepare. You can serve them as a side dish. I also found when left over these make great bean burritos, or you can even toss the extra with some cooked rice. You can recreate Chilis black beans at home. Place in sauce pan and mix through. Let simmer for about 20 - 25 minutes. Place beans on the bottom of plate. They should cover the middle of the plate. Place Chicken Breast in the middle, your serving of rice on the side, a generous helping of pico de gallo. and sprinkle with a tablespoon of crushed tortilla chips (optional). Picadillo is spicy meat. Pico de gallo is a spicy relish. We just use pre-seasoned (with a bit of salt and garlic powder) canned black beans (not drained) and our salsa in 1:1/32 ratio. So 32oz of beans would require 1fl oz of salsa.